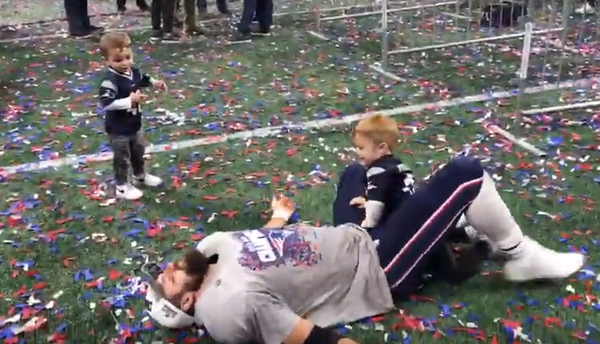 Super Bowl Player Forgoes Interviews To Roll Around On Field With His Tiny Sons. At the end of the day, it doesn’t matter what we do for work. What matters is the people we come home to. 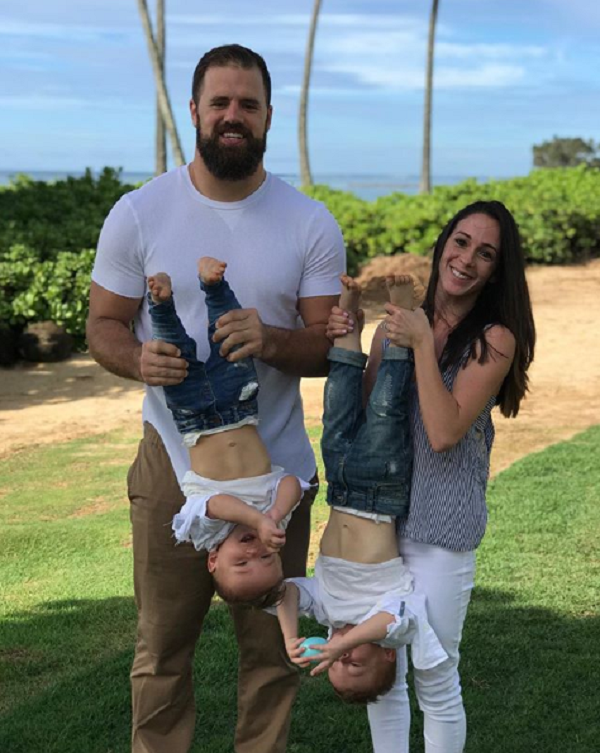 Fans of the New England Patriots were thrilled when the team won their sixth Super Bowl, but no one seemed more overjoyed by the big win than fullback James Develin. 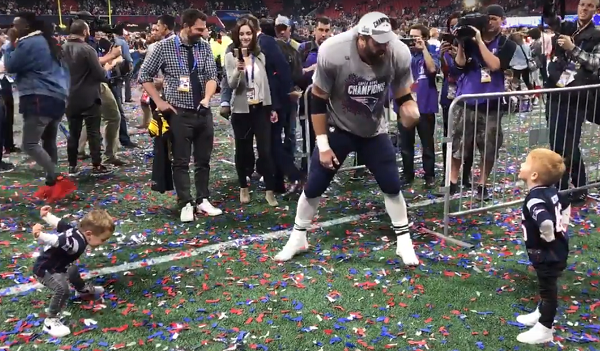 James was the lead blocker on the touchdown that won Super Bowl LIII, and it seems the only people the 30-year-old NFL player wanted to celebrate with were none other than his wife and kids. James and his wife Jennifer have two sons, James III and William Robert, and a daughter Adrienne Mattea. Both boys were at the big game, all decked out in tiny Patriots jerseys emblazoned with their dad’s name. The two seem like chips off the old block as they ran up to greet their dad after the game, and James instantly went into “fun dad” mode as soon as he saw them. If he was at all tired, which, of course, he was, he didn’t show it! As the red, white, and blue confetti fluttered to the ground around them, James and his sons engaged in a playful wrestling match that had everyone around them saying aww. It’s as though the entire stadium full of people have disappeared as James tussles with the boys, repeatedly falling to the ground as if mortally wounded by their tiny fists. We love how both of the boys have clearly been taught to help each other up when they’re on the ground, a habit you often see on sports fields. Little William runs up to his dad and puts his small hand inside James’s big mitt, leaning back as if helping his father up from the ground. James responds by sitting up as if his son has done the work, giving the child confidence and teaching him an important message — always help others when they are down, even if they’re your opponent. As if we didn’t already love this doting dad enough, after their wrestling session the proud papa skipped the post-game interviews in favor of having snack time with his kids. James seems to adore spending time with his kids, and that devotion shows in the way they look at him! Something tells us that these kids are going to grow up knowing that their dad puts them before everything else in life. What a great dad! 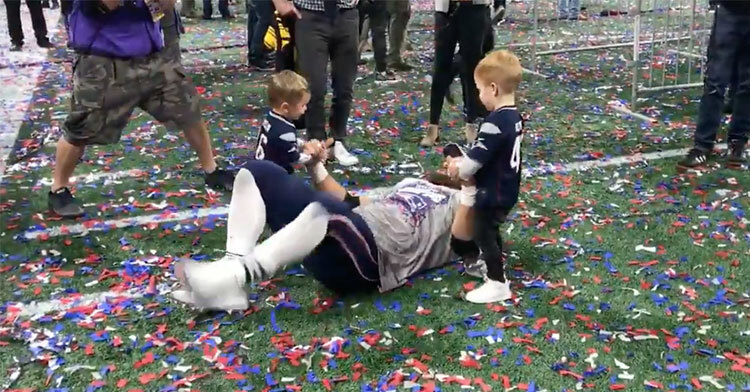 Check out James Develin celebrating his Super Bowl LIII win with his sweet sons in the video below, and be sure to share this delightful moment with others.